Many people think that cheap golf in Brea means that you are playing on a less than great golf course, but the truth is that the Brea Creek Golf Course is a challenging par 29 golf course that meets the needs of every golfer. The course comes equipped with a putting green and large driving range to help you with your game. The course was designed back in 1957 by William F. Bell. 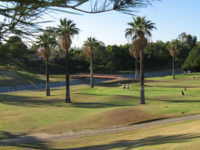 The course has a large variety of different par 3s and par 4s. The course slope and rating are unavailable, but yo ou can trust the experienced golfers that play the course because they say it is challenging and fair. Each hole provides for great scenery and new shots. When you are finished with your round or simply making the turn for the different tee markers, you will find that the beverage cart will be available. The 1,679 yard course boasts some of the best golf available when you only have a little bit of time to get your round in. The Brea Creek Golf Course tee times are available by calling the course, or you can get them online. Whenever you are ready to experience the great golf in California, call early to get the best Brea tee times.